What's a Rib Flare and What Does it Mean? Next time you're lying on your back, place your hands on your lower ribs. As you move your hands down those ribs toward your belly button, did you notice a drop off as your ribcage ended and your hands moved onto your abdomin? Was one side worse than the other? You, my friend, have a rib flare. These are very common, but are not normal. They are a clear warning sign that your core strength is lacking and you are on your way to pain and/or dysfunction. Our abdominal muscles all attach to the bottom part of our ribcage. The rectis abdominis (or six pack muscle) attaches to the ribcage in the front where it then travels down an attaches to the pelvis in the front. This muscle curls the trunk forward and is NOT a postural, or true core, muscle. It is also the most superficial muscle. The next two groups are deeper toward are spine and do function as postural muscles. 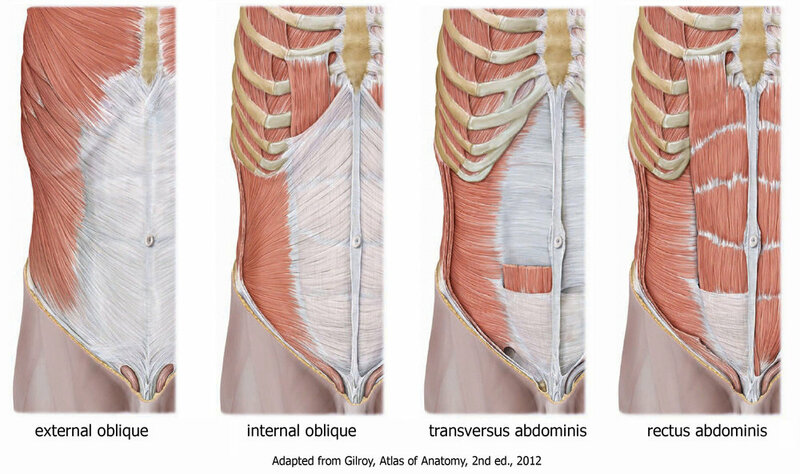 These are the obliques, specifically the internal obliques, and the transverse abdominis. These groups of abdominals are much wider and also attach to our lower ribs and top of the pelvis, but touch more bony surface area. When these muscles are strong and have good resting tone, they keep the ribcage held in an upright position. When these muscles become weak, they allow the front part of the bottom of the ribcage to flare upward and outward. The entire ribcage becomes extended which flattens out midback, overly arches our lower backs, cause our heads to more forward, and disallow good ribcage motion with walking and breathing. This can cause any number of issues- headaches, neck pain, shoulder problems, lower back pain, etc. This also causes our diaphragm to move from a functional, domed position (similar to that with a held exhalation), to a flattened, ineffective one (similar to that with a held inhalation). When the diaphragm loses it's "zone of apposition" that would normally be maintained with good abdominal strength, we cannot effective breathe with it. When we cannot breathe with the diaphragm, the primary muscle of respiration, we must find other ways to get air into our lungs. We can do this many ways: extending our lower backs to open up our abdomin, using our neck muscles to try to lift the ribcage upward, or a combination of the two. This is how pain develops. To fix this, the internal obliques and transverse abdominis muscles need to be targeted. Not only does the rehabilitation effort need to be very targeted, it needs to be functional, i.e., it needs to be done with proper breathing mechanics. We must return the position of the diaphragm to one of a functional, domed, exhaled position. The only way to properly do this is with your internal obliques and transverse abdominis. It is not possible to fully rehabilitate and restore core strength and control without proper respiration and abdominal strengthening at the same time.